Every bakery, cake shop, restaurant, and any other food related business should consider having a website and a strong online presence. Having a simple and stylish website will only grow your business and attract new customers because it offers people a way to learn more about you and how to reach you. Even if you might not believe it at first, building a website is not as hard as it used to be. Beginners can do it too. For starters you can use WordPress as your content management system which is free and very well supported. Afterwards, all you need is a theme that will match your style and content. This is why we have hand-picked the best cake shops WordPress themes of the year. We strongly believe that all the themes selected to be on this list can bring a lot to the table and are perfectly fitted for any type of food business. 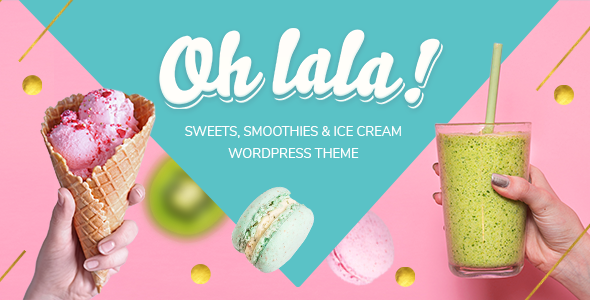 Ohlala is an acclaimed, bubbly, exciting, colorful, and fresh cake shops WordPress theme. Ohlala is an extremely resourceful theme ideal for developing modern websites for bakeries and cake shops. There is no coding experience required in order to use this theme and create something unique. It comes with chic inner page layouts, a cost calculator, option to import the demo content, Google fonts, intuitive page builder, shop integrated, and custom icons suitable for desserts. Your creativity will know no limits with Ohlala! 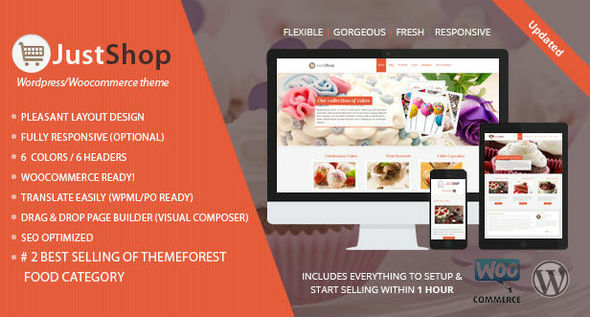 JustShop is a gorgeous, versatile, clean, pristine, and colorful cake shop WordPress theme. With this theme you will start on the right foot and gain popularity in no time. JustShop is perfectly intuitive and easy to navigate – your users will have no problems getting around. Some of its impressive options are the integrated drag and drop page builder, unlimited color schemes, header layouts, full dummy content, RTL child, portfolio, and catalog mode. This is the theme you need! 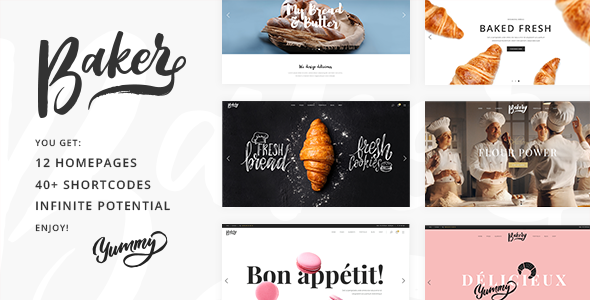 Baker is a beautiful, bold, complex, brilliant, and responsive bakery WordPress theme featuring a plethora of options and tools ideal for food related websites. It was built using only the most recent and updated standards and technologies thus creating a well-rounded, SEO and speed optimized theme. It is integrated with features like 12 homepages, more than 40 shortcodes, blog layouts, galleries, header types, menus, testimonials slider, and much more. Nowadays is hard to find a more complex theme than Baker! 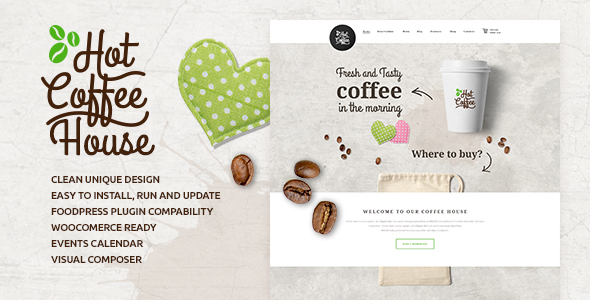 Hot Coffee is a minimal, enchanting, clever, crafty, multipurpose cake shop WordPress theme. Apart from being an incredible solution for bakeries, it can also be used for coffee stores, bars, liquor stores, and more. Setting it up is beyond easy but if encounter issue their support team is always there for you. Hot Coffee supports sticky menus, translations, and most popular plugins. Furthermore, it contains a page builder, shortcodes, unlimited colors, Google fonts, and Fontello icons. You get plenty of features with Hot Coffee - try it. Bakery, Cafe & Pastry Shop might have a long name, but it also has a long list of features and tools. I can say without a doubt that is theme is one of the best cake shops and bakery WordPress themes. To mention some of its features, this stunning premium theme offers 3 homepage layouts, integrated Visual Composer, SEO optimization, translation options, free support and updates, shortcode builder, and an ample documentation. This is a theme you do not want to miss out on. Try Bakery, Cafe & Pastry Shop! 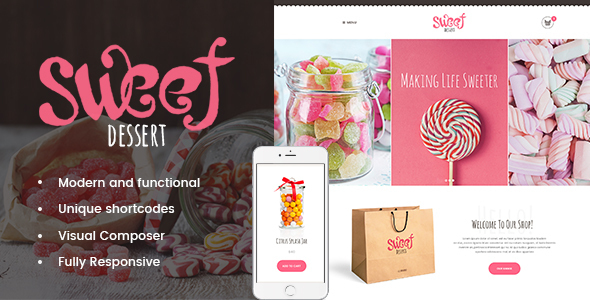 Sweet Dessert is a memorable, joyful, interesting, impeccable, attractive, responsive cake shops WordPress theme. It is the perfect platform for presenting dessert and food related businesses because it has an appealing design that will stick with visitors long after they have closed the website. Some of this theme’s key features are cross browser compatibility, responsiveness, one click demo install, interactive search field, Google fonts, unlimited color schemes, Visual Composer, retina ready, and several layout options. The header, footer, and background are all fully customizable and its integrated premium slider offers the option of displaying your most beloved products in the slides. Get Sweet Dessert! 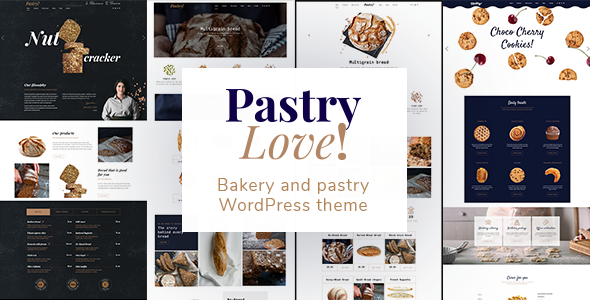 Bakery is a solid, effective, beautiful, eye-catching, reliable WordPress theme created to satisfy the requirement of bakers and cake shop owners around the world. And although it might have been initially developed with this in mind, Bakery can and will adapt to all sorts of industries. Bakery is a powerful theme containing 6 header layouts, parallax effects, coming soon template, unlimited sidebars, custom shortcodes, and over 80+ pre-build pages. 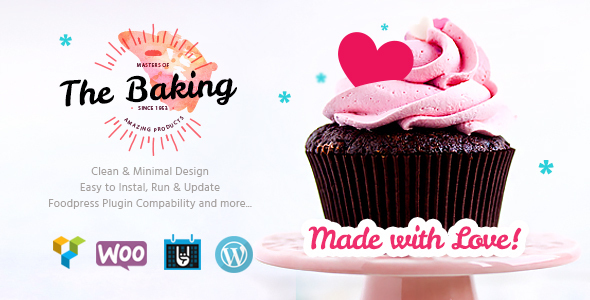 Overall, this theme is a potent cake shop WordPress theme. Designed and developed by Axiomthemes, Food and Drink is a theme that will exceed your expectations. Its design is clean and minimal, but it overcompensates for this in features and options. It can be used for restaurants, breweries, coffee shops, bars, and bakeries. With Food and Drink you benefit from amazing features such as table reservations, demo install, Visual Composer, events, slider, custom menu, and stunning hover effects and transitions. Get started and create your dream website for your dream business. Taking up the ninth position is Fable, one of the most powerful and stylish cake shops WordPress themes available. Fable is adaptable to all mobile screen sizes and devices, SEO friendly, and translation supported. 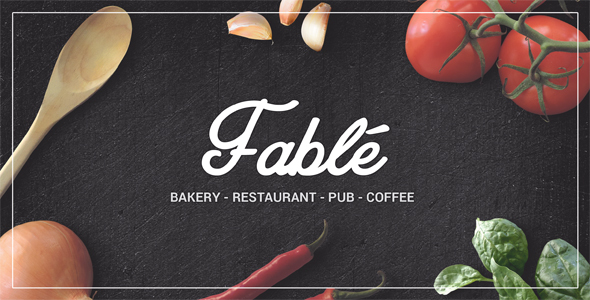 Fable includes Slider Revolution and VC page builder, many shortcodes and widgets, various layouts, and a complete step by step documentation. You will find joy in personalizing your theme thanks to its intuitive and easy to use theme panel. If you want support, Fable’s support team is prepared to handle any questions you throw at them. 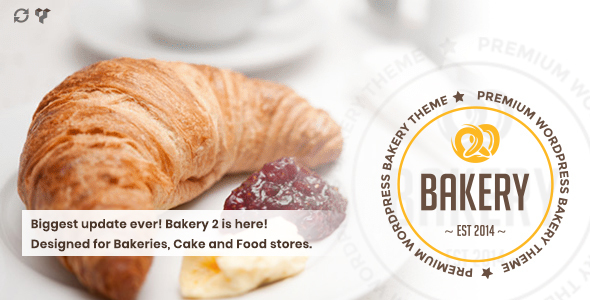 The next entrance on our best cake shops WordPress themes is held by Bakery. Cake shops and bakeries and easily showcase their mouth-watering dessert with this theme. It has seamless transitions and hover effects that will entertain your audience and make a lifelong first impression. 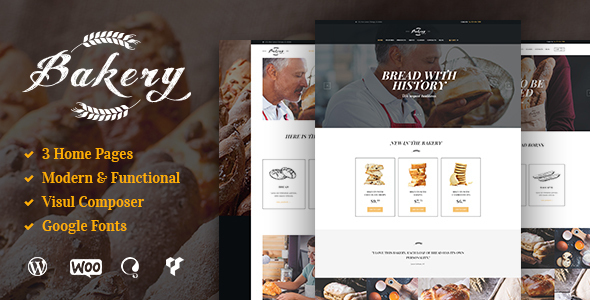 Apart from its cute and fully responsive design, Bakery also features a drag and drop visual page builder, 3 homepage designs, mega menu compatibility, sticky menus, Google maps, parallax effect, and a useful documentation. Using all these features you can present your business to the world in an appealing manner and gain new clients. Invisio Cake is a high-quality, premium, responsive, unique, creative, and stylish cake shops WordPress theme. It is responsive out of the box as well really easy to install and set up. If you want to recreate the demo look you can do it by importing it in a one click install. Invisio Cakes also offers an interactive map, page builder, blog layout, contact form, and Swiper slider. You will not find a user friendlier theme on the market than Invisio Cakes. 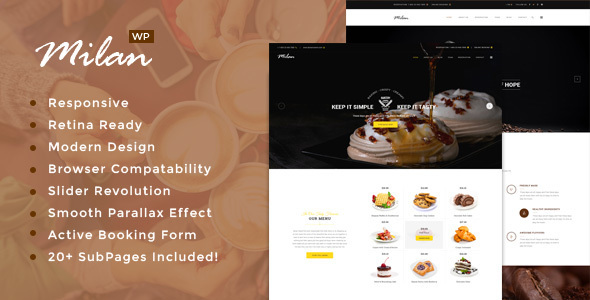 Choose this theme if you are looking for a robust, versatile, imaginative, memorable, and 100% responsive bakery WordPress theme. Thanks to its customizable design and layout, Sweet Cake can be used for any type of business, but it shines when used for food related websites. 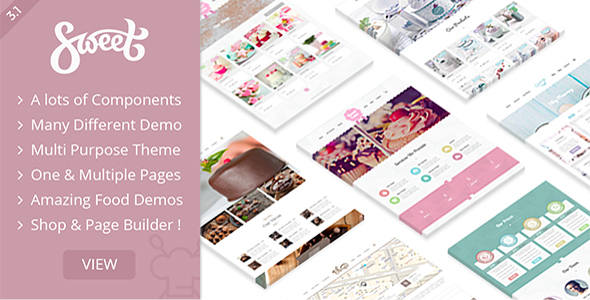 Included with Sweet Cake is a powerful premium page builder plugin as well as Revolution Slider. With these two combined with your theme’s admin panel you will be unstoppable – you can creative anything you have in mind for your business. Launch a stunning website with Sweet Cake! Milan is one of the easiest to use, incredible, gracious, glamorous and completely responsive premium cake shops and bakery WordPress themes. This theme can be installed and set up in literally minutes without any coding required. Milan is equipped with Visual Composer, Slider Revolution, dummy content, Google fonts, PSD files, documentation, and a fluid and flexible layout. Also included with the theme for free is the tech support which is well prepared for any questions you have. As you might have guessed Tasty is a premium theme perfectly suitable for cake shops, bakeries, restaurants, and other food related businesses. Thanks to its impeccable and gorgeous design it will bring new life into your business and spread the word. 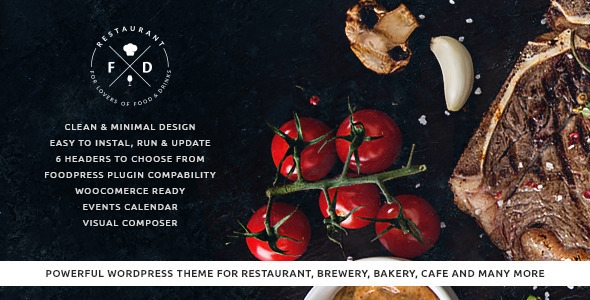 Tasty features custom made design elements for restaurants, 2 menu layouts, blog templates, integrated contact form, creative galleries, wishlist, 2 premade homepages, and quotes for chefs sections. All these elements will draw the attention of your visitors and keep them engaged. 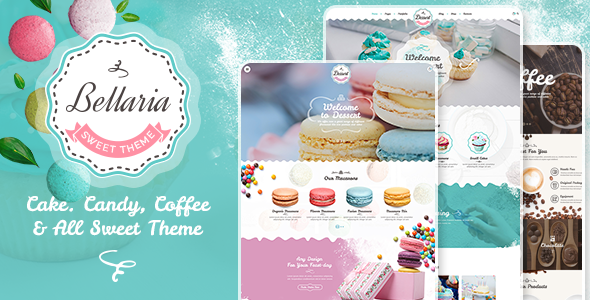 Bellaria is a colorful, joyful, fantastic, contemporary, powerful cake shops WordPress theme. If you choose Bellaria you will be able to present your business with style and confidence. It encompasses over 20 unique page layouts, recipe layout, shortcode generator, custom food icons and shapes, and colors management. No matter the device they use, your visitors will be able to experience the same beautiful layout because Bellaria is fully responsive and adaptable to various resolutions. This theme will help you interact with your visitors and showcase your best products efficiently. This theme deserves all the attention it can get because of how amazing and impressive it is not only in design and layout, but options as well. Pastry Love is the ideal platform for small or large food related businesses around the world. It is full of resources some of which are header and menu styles, fast demo content import, 800+ Google fonts, Bold Builder, custom icons for bakeries, translation ready, and custom developed shortcodes. Pastry Love is clearly a great addition to any website. 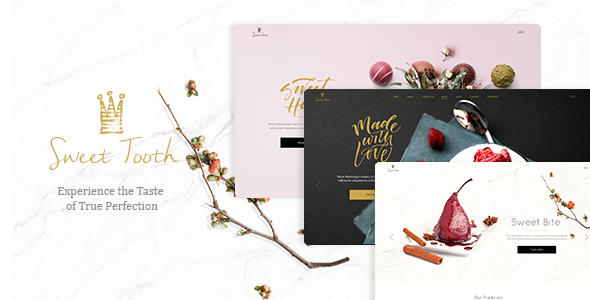 Sweet Tooth is a dazzling, visually pleasing, eye catching, and professional bakery WordPress theme suited for businesses in the dessert niche. You get 7 pre-designed homepage layouts to choose from as well as several pre-built inner pages layouts. Sweet Tooth can be easily customized from the theme’s intuitive admin panel without having to write a single line of code. If you are short on time you can import the demo content with one single click and start from there. Its responsive design will give your business a plus and users will be able to salivate after your goods no matter the device used. There you have it, the best cake shops WordPress themes. Each one of these themes will improve your website and enhance your content. They are all responsive, supported, and constantly updated. Thank you for reading this article and, don’t forget, if you know a theme that might be a great fit for this list contact us and we will be sure to add it.